HomeCar MagnetsBreast Cancer Awareness Pink Ribbon Mini Magnet 4" x 2"
Buy the small "Breast Cancer Awareness" Pink Ribbon Car Magnet. 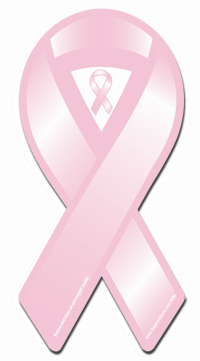 Our "Breast Cancer Awareness" ribbon magnet is manufactured and printed in the USA, exact dimensions are 4.13" tall by 2.0" wide. We print on premium quality, super-thick (.030) magnetic material with UV protected inks. Be sure to remove, clean and reposition your magnet weekly. We also carry "Breast Cancer Awareness" Rubber Bracelets. Allow us to create custom "Breast Cancer Awareness" Rubber Bracelets and Ribbon Magnets for your organization or next event. I love the size of the Mini Magnet....it looks perfect on my car. Bought these to give away on our Bike Club ride we do to support Breast Cancer. Very nice magnets and size to fit Motorcycles. The price is very reasonable. Will buy again !